June 8, 2018, 11:54 AM · Welcome to "For the Record," Violinist.com's weekly roundup of new releases of recordings by violinists, violists, cellists and other classical musicians. We hope it helps you keep track of your favorite artists, as well as find some new ones to add to your listening! 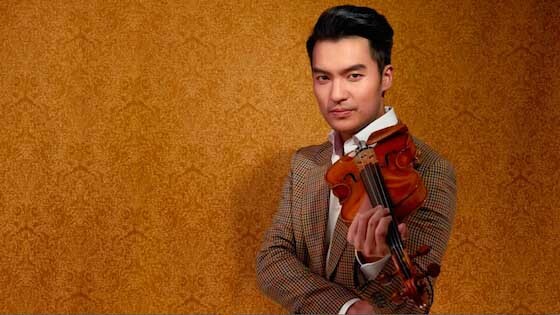 Ray Chen's newest recording features works chosen from what the artist considers the "Golden Age" of the violin, including the Bruch Concerto as well as arrangements and transcriptions by Fritz Kreisler and Jascha Heifetz, which Ray performs with pianist Julien Quentin, including Kreisler’s "Syncopation," "Schön Rosmarin" and his version of Cyril Scott’s "Lotus Land," and Heifetz’s transcriptions of "Estrellita" by Manuel Ponce and George Gershwin’s "Summertime." Stephan Koncz has also arranged Debussy’s "Clair de lune" and the traditional Australian favorite, "Waltzing Matilda," as Chen is from Australia and Taiwan. The album opens with a string quartet arrangement called "A New Satiesfaction," which features Gymnopédie No.1 by Erik Satie, with an allusion to Rossini’s William Tell Overture. It is performed by Chen and his Berlin-based quartet, all of whom are members of the Berlin Philharmonic. A master of digital media, Chen has even come up with a Golden Violin Game to go with his album! BELOW: Ray Chen plays "Waltzing Matilda" with his quartet, Made in Berlin, a chamber music string collective made up of members of the Berlin Philharmonic. "Re-emerging from a seven-month pause from concertizing to focus her attention on meditative practices and the merging of meditation and music, Caroline is reopening the 2018 season with the release of her third album on Claves Records." Caroline has studied with Christian Tetzlaff, Donald Weilerstein, Paul Kantor, Joel Smirnoff and Julia Kurtyka. A past member of the Stradivari Society, Caroline currently plays a Giovanni Battista Rogeri (1675), courtesy of Peter and Cathy Halstead. BELOW: Caroline Goulding plays the first movement of Erich Wolfgang Korngold's Violin Concerto in D Major. U.K.-based violinist Thomas Bowes Tom undertook an extensive "Bach Pilgrimage" in 2013, giving 50 concerts of Bach's unaccompanied Sonatas and Partitas in churches across Britain and raising over £20,000 for various charities. This summer he will embark on another a Bach Pilgrimage across Britain, and he plans to continue to do so every year. From the notes about the album: "Bowes believes that these six stand-alone compositions, while each individually offering insight into Bach's genius reveal more when taken as one epic work - and especially when set against the tragedy in Bach’s life in the year of composition. Bowes views these six compositions as a vehicle for exploration into the existential, taking his cue from Bach’s cryptic title 'sei solo,' which reads 'you are alone,' punning on the Italian for '6' and 'you are.'"